Anet is the net area of the angle. For an unequal-leg angle connected by its smaller leg, Anet should be taken as equal to the net section area of an equivalent equal-leg angle of leg size equal to that of the smaller leg. (1) The Lug angle shown in Figure 3.10 connects angle members and their fasteners to a gusset or other supporting part and should be designed to transmit a force 1,2 times the force in the outstand of the angle connected. (2) The fasteners connecting the lug angle to the outstand of the angle member should be designed to transmit a force 1,4 times the force in the outstand of the angle member. (3) Lug angles connecting a channel or a similar member should be designed to transmit a force 1,1 times the force in the channel flanges to which they are attached. (4) The fasteners connecting the lug angle to the channel or similar member should be designed to transmit a force 1,2 times the force in the channel flange which they connect. (5) In no case should less than two bolts or rivets be used to attach a lug angle to a gusset or other supporting part. (6) The connection of a lug angle to a gusset plate or other supporting part should terminate at the end of the member connected. The connection of the lug angle to the member should run from the end of the member to a point beyond the direct connection of the member to the gusset or other supporting part. (1) Where fasteners are required to carry an applied tensile force, they should be designed to resist the additional force due to prying action, where this can occur. NOTE: The rules given in 6.2.4 implicitly account for prying forces. (1) When a moment is applied to a joint, the distribution of internal forces may be either linear (i.e. proportional to the distance from the centre of rotation) or plastic, (i.e. any distribution that is in equilibrium is acceptable provided that the resistances of the components are not exceeded and the ductility of the components is sufficient). - where connections are subjected to impact, vibration or load reversal (except wind loads). 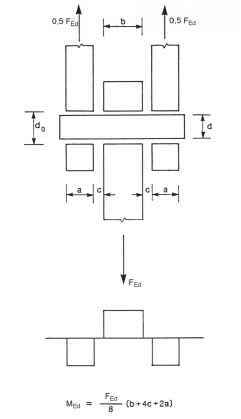 (3) When a joint is loaded by a concentric shear only, the load may be assumed to be uniformly distributed amongst the fasteners, provided that the size and the class of fasteners is the same. (1) Wherever there is a risk of pins becoming loose, they should be secured. (2) Pin connections in which no rotation is required may be designed as single bolted connections, provided that the length of the pin is less than 3 times the diameter of the pin, see 3.6.1. For all other cases the method given in 3.13.2 should be followed. 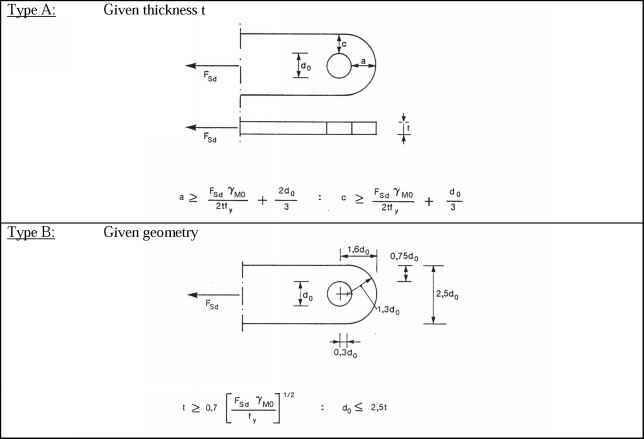 (3) In pin-connected members the geometry of the unstiffnened element that contains a hole for the pin should satisfy the dimensional requirements given in Table 3.9. (4) Pin connected members should be arranged such to avoid eccentricity and should be of sufficient size to distribute the load from the area of the member with the pin hole into the member away from the pin. 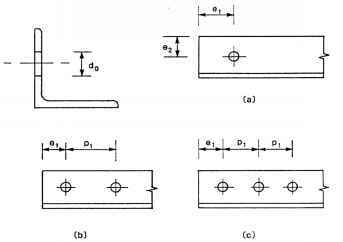 (1) The design requirements for solid circular pins are given in Table 3.10. (2) The moments in a pin should be calculated on the basis that the connected parts form simple supports. It should be generally assumed that the reactions between the pin and the connected parts are uniformly distributed along the length in contact on each part as indicated in Figure 3.11.